As Hollywood reels from a deluge of allegations of sexual harassment, many Americans report that they too have experienced sexual harassment in the workplace. Gallup Senior Editor Lydia Saad joins Frank Newport to discuss the percentage of Americans who say they have experienced sexual harassment at work -- and the increase in how serious they feel the problem is. Lydia also discusses the recent uptick in Americans' support for gun control in the wake of a mass shooting at a church in Texas. Listen to "How Widespread Is Sexual Harassment in the U.S.?" on Spreaker. The percentage of women who say they worry about being sexually assaulted is up slightly from the last three years but near the average in Gallup's trend. 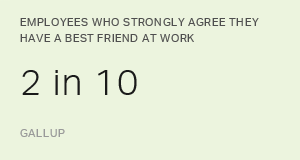 Having a best friend at work links to business outcomes such as profitability, safety and customer loyalty, Gallup finds.